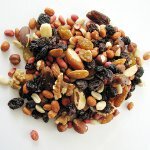 August 31 is the National Trail Mix Day. This food holiday is devoted to a type of snack mix consisting of dried fruit and nuts, sometimes with added chocolate. Trail mix is so named because it is considered a perfect snack to be taken along on hikes. It doesn't weigh much and is easy to store. Besides, nuts and dried fruit are very nutritious and therefore provide a quick energy boost. Trail mix is believed to be first invented in 1968 when two surfers from California mixed raisins and peanuts together for a snack. However, it is also mentioned in Kerouac's novel The Dharma Bums which was published in 1958. Apart from being a snack for hikers, trail mix is served as a cheap snack to accompany drinks. It can also be used as a party food. In many European countries, it is known as student food, student snack, or student mix. Common trail mix ingredients may include nuts, legumes (peanuts are in fact legumes and not nuts), seeds, dried fruit, chocolate, breakfast cereals, banana chips, carob chips, pretzels, shredded coconut, marshmallows, crystallized ginger. To celebrate the National Trail Mix Day, try out the following trail mix recipe. In a large container, combine 1 cup raw almonds, 1 cup raw sunflower seeds, 1 cup raisins, 1/2 cup chopped dried apricot, 1/4 cup flaked coconut, 1/4 cup chocolate chips. Cover and shake.